I have seen several other bloggers (Sew Caroline, for one) do a little collage of sorts to detail their seasonal sewing plans and thought I would follow suit. I have been slowly collecting apparel fabrics and patterns to beef up my handmade wardrobe the last few months and have actually have purchased all of the fabric/patterns that I show you. Meaning there should be nothing keeping me from actually making this clothing; except for that little thing called time and the two little people wanting some attention at my house 🙂 . It’s all about balance, folks…always a work in progress. I’m hoping that actually posting these collage ideas online will keep me a little better organized and motivate me to actually get them done! Kind of an online to-do list of sorts. Here’s the first one…note: the top is not necessarily meant to be worn with the shorts. Hmm, this unintentionally turned into a Grainline studios sewing list. I highly recommend her patterns for those who are looking for good women’s patterns. Also, I enjoy expanding my indie pattern designers list and would love to get some more ideas! Do you have a summer sewing list? Care to share? 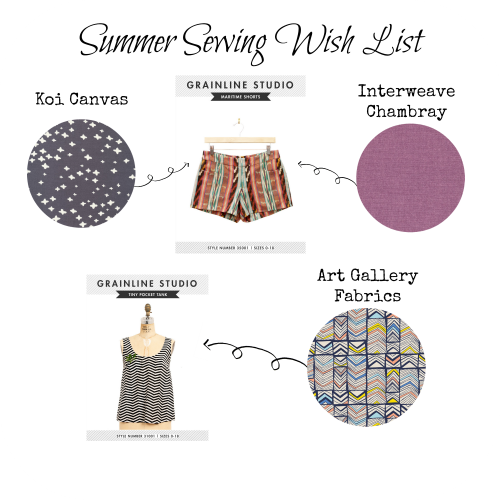 This entry was posted in Selfish Sewing and tagged Art Gallery Fabrics, grainline studios, maritime shorts, robert kaufman chambray, Robert Kaufman Interweave Chambray, sewing for women, tiny pocket tank by oliver's fancy. Bookmark the permalink. Can’t wait to see the shorts! And I have an ever growing list. A mix of indie patterns and vintage. Will see what I can get through! I love seeing your vintage patterns. I am solely an indie pattern person. They just make more sense to me. I have never had luck with the other ones… Can’t wait to see your sewing!